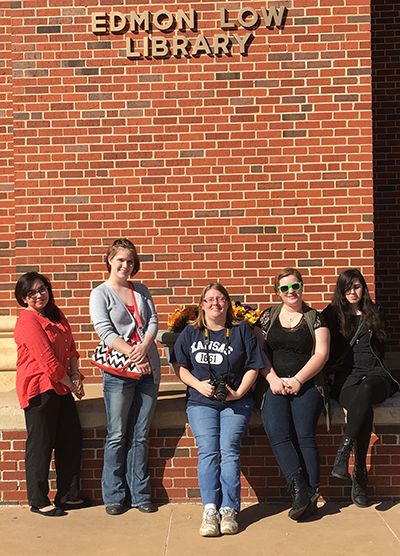 A creative writing group from Cowley College’s Focused Seminar class recently visited Oklahoma State University for the production “Ain’t I a Woman!”, titled after a speech by abolitionist Sojourner Truth. The chamber music theatre production, sponsored by their Gender & Women’s Studies Program, highlighted the lives of African American women, including author Zora Neale Hurston. The musical score was drawn from spirituals of the South, the Jazz Age, and contemporary African American composers. Prior to the performance, the group toured some campus areas, including Edmon Low Library, where they enjoyed the stacks of books and the new technology available to students. Next up for the Creative Writing program is hosting poet Todd Fuller and screenwriter Randi LeClair on March 28-29. Students will work with the writers during the day. On the evening of March 28 at 7 p.m. in the Earle N. Wright Community Room, there will be a reading by Fuller and some of the students who attend his poetry workshop. On March 29 Fuller and LeClair will present readings at Standing Bear Museum and Education Center in Ponca City, OK. For further information about these events, contact Marlys Cervantes at the College.